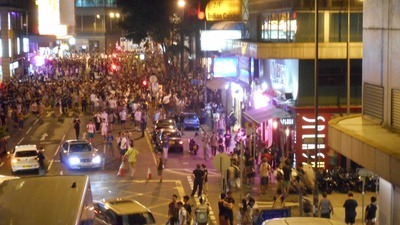 'What is Happening in Hong Kong Now? - Emergency Photo Report by ERIC! ', a talk show with ERIC and Akiko Ohtake, took place at Saravah Tokyo, in the basement of this building in November 2014. Slides of his photographs were powerful, vividly depicting the young people of Hong Kong fighting the government. ERIC is a photographer. Slides do not do justice to his photographs. I thought it was important for people to see his photographs as prints. 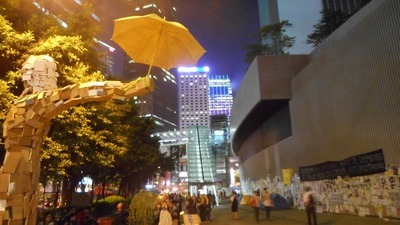 Though the demonstrations have ended, the events in Hong Kong questioned the world of money and power. It made me fully realize that the issue affects us all. ERIC's parents were born in China. During the Cultural Revolution, they smuggled themselves into Hong Kong where ERIC was born. The year Hong Kong was handed back to China, he was 19 and not wanting to see Hong Kong 'becoming' China, he left for Tokyo on his own. 17 years have passed since and the young man who was not particularly interested in photography is now a photographer. He travelled to China, India and Hong Kong with his camera. 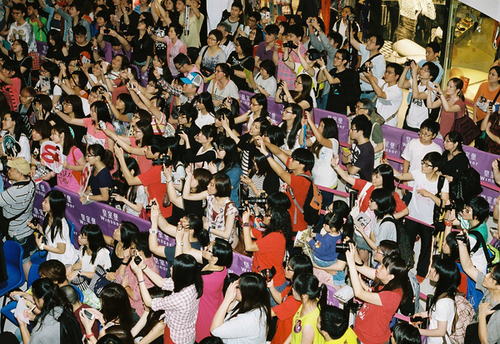 This exhibition is made up of photographs taken in China in 2006, and in Hong Kong last year. 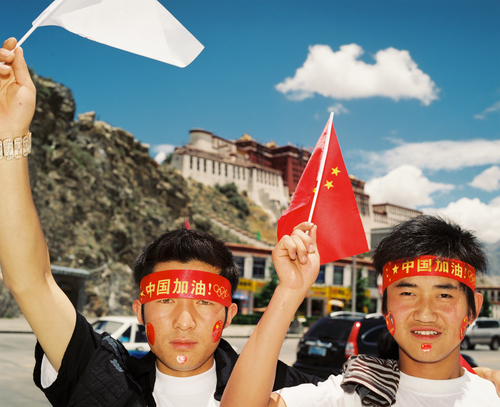 In 2006, he decided to see China, a country which he had a prejudice against, for himself and travelled to many parts of the country. Then, the recent demonstrations took place and he was dragged back to Hong Kong, a place where he has not photographed before. these places combined. I hope you can get the sense of him warmly watching over his homeland, though at a distance, as if to say 'GOOD LUCK!". 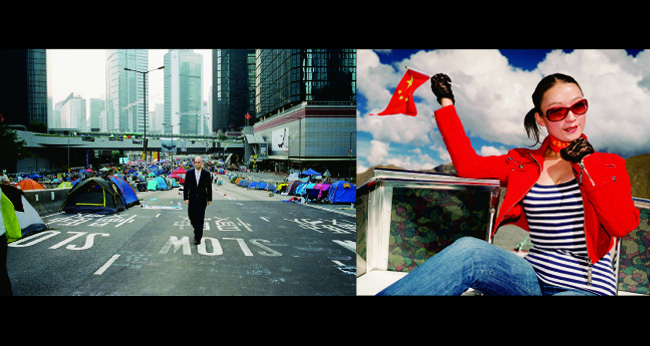 The exhibition will also be accompanied by a slide show of photographs of Hong Kong's Umbrella Revolution taken by a film director, Lim Kah Wai. January 2015, Atsukobarouh arts drinks talks. My parents fled to Hong Kong from China once they were adults. I was born and bred in Hong Kong and came to this country, Japan, at the age of 19. It has been 17 years passed since and I am about to catch up with what is happening in Hong Kong. I have never been a Chinese person and no longer a person from Hong Kong. I am not Japanese either. I visited China. I returned to Hong Kong and once again I come back to Japan. As I repeat these journeys, I really get the sense that I am Chinese, from Hong Kong and Japanese all at once. For me, what makes a person standing in front of me a human appears to be made up of three things, combined in a three-dimensional manner: common factors we share as humans; national characteristics; and personality. As a photographer, I wait for a moment when a subject, including his or her world, appears most like himself or herself and take a snap shot, presenting the subject in a non-explanatory manner. If I take a photograph of a single person, it is the person's character, and if I take a photograph of a crowd, then it is the character of the nation, which emerges in front of the three dimensionality of the subject. Either way, I want to enable the person to emerge vividly in the picture.